August | 2007 | That Mall is sick and that Store is dead! I had both Coliseum and Newmarket Fair dreams. In the Coliseum Mall dream, I think I had missed the demolition ceremony for the mall, and I had also missed a television special about the demolition. I got so upset by this I started crying, and somehow my cries appeased someone, and they had found me footage of the TV special, but the footage I was able to see looked as though it was shot though binoculars, all I could see was a distance shot of the mall area. 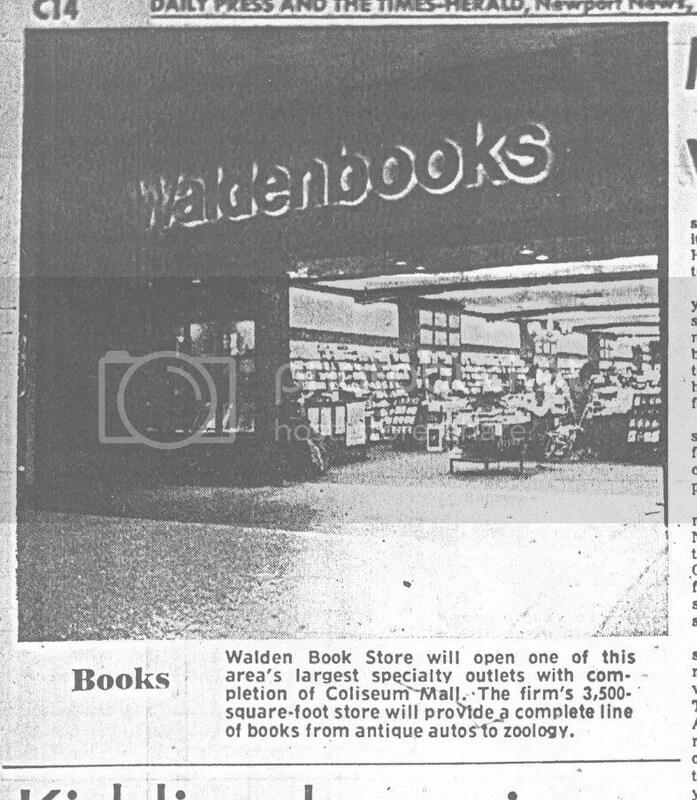 The mall was gone, but the J.C. Penney and the Hechts (yeah, when I was writing this dream down, I didn’t write Macys, whoops) was still up, but the new J.C. Penney was built and open — it seemed teeny tiny compared to the old J.C. Penney. 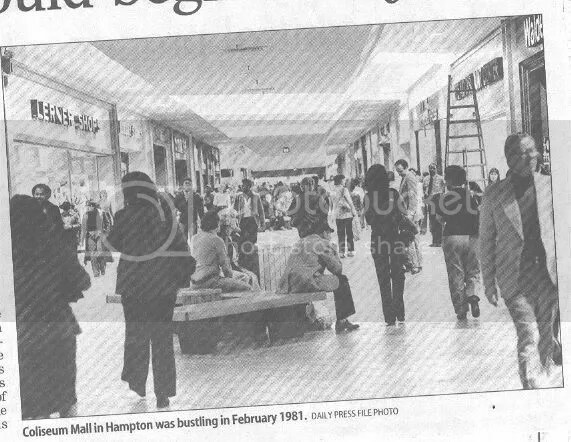 And the footage looked very old, as though it was shot on the mall’s opening day, not 30 something years later when the mall was dead. The Newmarket Fair dream I had took place after the mall stopped being a mall. Everything had been painted white (I guess as a primer coat), and even the insides of stores had been gutted and replaced with white dry wall. I was walking around, pretty much lost since everything was white. Then I realized that I had become trapped in the mall — and that Snape guy from the Harry Potter books and movies was keeping me captive. Every entrance in and out of a store had been drywalled over as I was walking through the mall, and I was trapped in the stores. I thought I was trapped there forever, until I saw a small opening between the dry wall, and the floor on the second level of the mall right above Sears. I could look through this space, and I could see a red light coming from the old Sears sign, and the floor to the first level. The space between the dry wall and the floor was large enough for me (shuh, yeah I know that must of been a BIG opening) to squeeze and fall through onto the first floor. I was scared, but I knew that it was my only way out. So I squeeze though the opening, and fell onto the first floor of the mall in front of Sears. There on the first floor was this annoying as —- student at my school who is never prepared for his classes, and is always clueless about everything. I assume we both ran out of the mall. I have the actual newspaper article from this too, I need to scan it when I go to school Tuesday. Shoppers flock to J.C. Penney for the store’s grand opening. It is the first Peninsula Town Center shop to open. At the grand opening of the J.C. Penney store in Hampton on Friday, Barbara Lash talked about the role the department store has played in her life. She was just 18 when Coliseum Mall opened in 1973. Then a student at Thomas Nelson Community College, Lash helped stock the J.C. Penney store leading up to the opening on Halloween. J.C. Penney was one of the mall’s three anchor stores, along with Korvette and Rices-Nachmans. She went away to James Madison University in 1975, but she would work at J.C. Penney when she was home on the Peninsula during school breaks. “It’s exciting that we’re going to have something new and different in Hampton,” said Barbara Lash, who lives in Newport News and teaches first grade at Samuel P. Langley Elementary School in Hampton. She still works at J.C. Penney part-time, a few times a week, in the jewelry department; on Friday, she had a 9 a.m. to 5 p.m. shift. Come October, she will have been on J.C. Penney’s payroll on and off for 34 years. When Coliseum Mall opened on Halloween in 1973, it was “the place to be,” Lash, 52, said. It was, at the time of its opening, the largest mall on the Peninsula. Most of the stores at the mall closed this past January and demolition began in February to make way for construction of the Peninsula Town Center, which is expected to be complete in the spring of 2009. The J.C. Penney store is the first Peninsula Town Center store to open. Its soft opening was Sunday, July 29, but its grand opening was Friday morning. Among the people who spoke before the 7:45 a.m. ribbon cutting were Raymond Tripp, who was the general manager of Coliseum Mall and will be the general manager of Peninsula Town Center, and Ross A. Kearney II, mayor of Hampton. 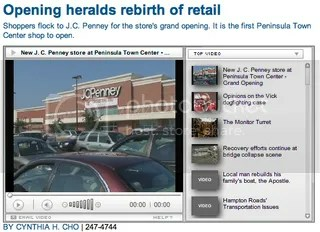 “Hello dedicated shoppers, how are you?” Kearney said to the 70 or so shoppers waiting in line around 7:45 a.m. “We are in a revitalization, a rebirth” in our community, he said, referring to the Peninsula Town Center. And this being a tax-free weekend in Virginia – there is no sales tax on certain school supplies, clothing and footwear – there were many parents shopping with or for their children. Rhonda Wagner, a 36-year-old high school teacher from Newport News, had brought all three of her kids: 9-year-old Paige, 4-year-old Parker and 2-year-old Payton. Paige, who will be a fourth-grader in the fall, said she wanted new clothes because she was growing out of some of hers. By 8:30 a.m., Diego Romo, 10, was holding two pairs of blue jeans. His stepdad, Elton Nurmi, a 28-year-old landscaper from Newport News, had in his hands two pairs of slacks, khaki and navy, in his arms for Diego. But few seemed as excited as 3-year-old Jordan Hall. She and her mom, Ashley Hall, 24, were shopping for new clothes for Jordan’s start at preschool in the fall. “I want that shirt!” Jordan said loudly and ecstatically from her stroller, pointing to a lavender shirt with pink glitter – pink and purple are her favorite colors.